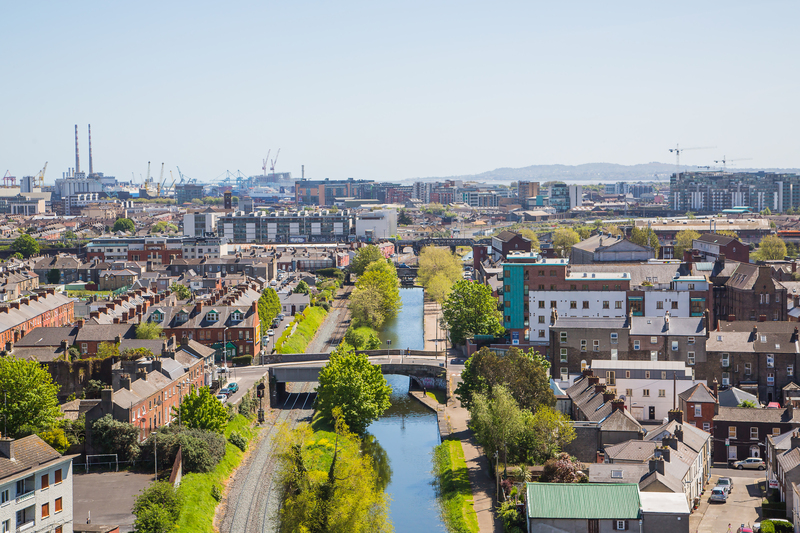 In its 2016-2022 Development Plan the city has set out a vision for a ‘Sustainable, Resilient Dublin based on economy, environment and equity’ (1). The Development Plan’s principles for green infrastructure include sustainable buildings which should use ‘sustainable energy technologies and innovative design solutions such as living walls, roofs as well as solar panels’. NBS could help address climate change, environmental infrastructure, green infrastructure, open spaces and recreation, cultural heritage and sustainable communities and neighbourhoods (1). For example, sustainable urban drainage measures are being encouraged as part of environmental infrastructure objectives to reduce flooding risks and to adapt to climate change and make the city greener. Dublin is also committed to reducing CO2 emissions by 20 % (3). Dublin has signed the Eurocities declaration on climate change. Biodiversity is one of the five focus sectors in its Climate Change Strategy for Dublin City 2008-2012 (3). Actions include creating a network of corridors linking Natura 2000 sites to each other, to green areas and to Dublin City conservation areas and opening up culverted streams and rivers, to allow species to adapt to climate change through migration. The strategy also aims to create new wetlands in the city, with artificial wetlands acting as water attenuation ponds, while providing a habitat for a range of organisms. Although soft engineering options should be used wherever possible on the coast, sand should not be removed from beaches and measures to protect and rehabilitate dune systems will be taken. All these measures seek to boost the natural resilience of the coastal system. The NBS in Table 1 are all generic actions proposed by Dublin City Council to sustainably address some of the challenges facing the city. In the Development Plan, sustainable urban drainage systems (e.g. permeable paving, swales, green roofs, rain water harvesting, detention basins, ponds and wetlands) are important storage areas for reducing surface runoff. They should therefore be integrated into new, and if possible, existing developments (6). They are also an integral part of green infrastructure and have a number of other benefits (see below). Green infrastructure, including green roofs and walls, is not only part of sustainable urban drainage systems. It is also important ways of improving air and ambient quality. The Development Plan Appendix (6) states that green roofs should be provided as standard in apartment schemes, industrial parks, utility buildings and larger commercial developments. It also advocates integrating green walls into larger development schemes. The Reusing Dublin mapping tool resulted in a 53 % increase in the number of officially known underused/vacant spaces and buildings. This shows how useful the tool is in helping to find long-term solutions for identifying such spaces for urban regeneration plans and meeting housing needs. It also shows how local people can help provide such information. Under the Development Plan, developers of residential areas who cannot fulfil the 10 % green space requirement must make a financial contribution to providing a new park in the area in question, improving an existing park and/or enhancing amenities in line with the city’s Parks Strategy (1). TURAS — Marcus Collier (marcus.collier@ucd.ie); Karen Foley (karen.foley@ucd.ie). Myles Farrell, Dublin City Council (myles.farrell@dublincity.ie).